In the latest Southern cozy from the author of The Calamity Café, small-town chef Amy Flowers can’t take her freedom for granted when she’s served up as a murder suspect . . . It's Independence Day in Winter Garden, Virginia, and the residents are gearing up for their annual celebration. The Down South Café is open and flourishing, and Amy Flowers is busy making pies and cakes for the holiday. The only thorn in her side is Chamber of Commerce director George Lincoln, who is trying to buy the café so he can tear it down and build a B&B on the site. When George collapses while eating at the Down South, everybody assumes it's a heart attack—until the autopsy declares it to be poisoning. Now, it’s up to Amy to prove her innocence before her liberty is lost. Amy Flowers finishing earning her degree in culinary school when her beloved Nana got sick. She came back to her hometown of Winter Garden, Virginia, to be close and got a job as a waitress at Lou’s Joint, a café owned by Lou Lou Holman. When Lou Lou was killed (see The Calamity Café), her son sold the café to Amy. Amy has since renovated the café and is enjoying a booming business. She’s currently gearing up for the town-wide Independence Day celebration. Note: this post was supposed to run on April 7, but then strokes happened and I ended up in the hospital. I apologize to Gayle and Amy for the delay. Amy, how did you first meet Gayle? I met Gayle at lunch one day. She got to talking to me about her grandmother and how close they were. She said she used to stand at her grandmother’s side and watch her cook. I told her we had that in common, and I started telling her all about Nana. That’s the thing about writers—once you get to talking with them, you never know what will wind up in a story. I think it’s because I came upon my former boss—Lou Lou Holman—slumped over her desk dead. And then I became determined to find out who’d killed her. I mean, for one thing, I was a suspect, and for another, I wanted to buy that café. Would you want to eat food prepared by someone suspected of murder? So, I guess I have a pretty interesting life . . . even though it doesn’t always feel that way to me. I really enjoyed going to the Independence Day dance. The dance takes place in a converted barn, and it’s just a fabulous old place. Anyway, Aunt Bess was there, all decked out in her Independence Day finest, and she told me she was waiting for her date. Come to find out, she’d used my mom’s photo for her profile on an online dating site. That poor man was so confused! I enjoy looking through cookbooks to find new recipes. I also love reading and watching movies. I love my mom, Aunt Bess, and cousin Jackie. Jackie works with me at the café, and she’s like my right arm. Aunt Bess is a total hoot. She has discovered the Internet and likes to be on Pinterest. She has boards named People I’ve Outlived; Lord, Have Mercy; and Stuff I’d Like to Eat. The Stuff I’d Like to Eat board is filled with things Aunt Bess wants Jackie and me to cook for her. And we usually do. That gorgeous deputy Ryan Hall is wonderful. He and I have been on a few dates since the murder case of Lou Lou Holman wrapped up. We couldn’t date before that because I was a suspect in her murder. The only person in town I really have a problem with is George Lincoln. That man is as pushy as all get out. He wanted the café before I bought it. And now, even though I’ve put all this time, money, and work into it, he asks me just about every day to sell it to him so he can tear it down! He won’t take no for an answer. I’d love to take that gorgeous deputy I was telling you about, along with a picnic lunch, and go to the lake. We could rent a paddle boat or a canoe, have a picnic, and then sit on our blanket and watch the sunset. I have to tell you, people must think I’m like a bartender except with food because they typically start to confide in me first thing. And it doesn’t stop when they’ve gotten to know me. I guess I just have one of those faces. Maybe I look trustworthy. I mean, I am trustworthy, but they don’t know that . . . at least, not at first, they don’t. The absolute worst thing that ever happened in my life was the death of Nana. And about all I learned from that was that you never quite get over losing someone you love. The next worst thing was finding my former boss dead at her desk in the café office. That was terrible, but it taught me that I’m stronger than I realized. My best friend is my cousin Jackie. She’s just a little older than me, so it sometimes feels like we’re sisters instead of cousins. Aunt Bess is Jackie’s grandmother, and Jackie and I make Sunday lunch for Mom and Aunt Bess every week. Jackie is (finally) dating Roger. Roger has been our friend since we were kids, and there has been a special spark between the two of them for years. I finally talked him into asking her out. So far, so good. But if things go south, I’m afraid they’ll both blame me for it. Gayle Leeson is a pseudonym for Gayle Trent. She also writes as Amanda Lee. 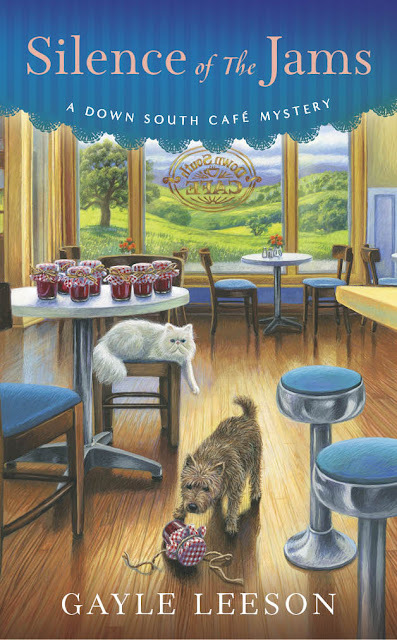 As Gayle Trent, she write the Daphne Martin Cake Mystery series and the Myrtle Crumb Mystery series. As Amanda Lee, she writes the Embroidery Mystery series. 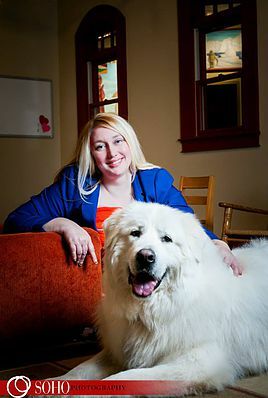 Gayle lives in Virginia with her family, which includes her own “Angus” who is not an Irish wolfhound but a Great Pyrenees who provides plenty of inspiration for the character of Mr. O’Ruff. She's having a blast writing this new series!